Genesis Framework Review - Build Your Dream Website Today! Do you use WordPress? If so, then you’ve most likely heard of StudioPress and the Genesis framework. WordPress and StudioPress go together like a hand in a glove because WordPress sites are built around themes, and StudioPress makes some of the best themes out there. Genesis is the framework upon which these themes are built. 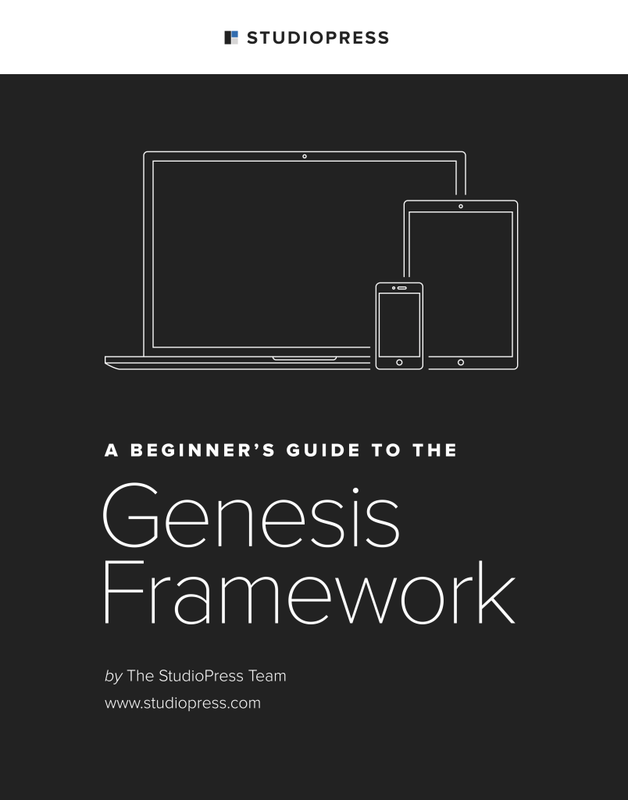 Find out why StudioPress is so fabulous by reading my Genesis framework review. What Is A StudioPress Theme? Studiopress is the platform behind the Genesis website framework. This framework makes its possible to build awesome websites efficiently and effectively within WordPress. Genesis is a WordPress supertheme that allows you to put other themes on top of it. A child theme, specifically, sits on top of this framework, and is responsible for the layout and design of your site. To clarify, StudioPress has two components to it, the Genesis framework and a child’s theme. Genesis is responsible for the function of your website as it provides the framework, while the child theme’s role is to handle the design. Child themes have the same functionality and styling ability of their parent themes, but are safer to customize. This is why all StudioPress’s themes are child themes. You can customize to your heart’s content on a child’s theme without worrying that your hard work will be obliterated at some point by a theme update. Changes made on a child’s theme will not affect the original theme’s code. On the other hand, if you make changes on a parent theme, and it gets updated, which it will, all your changes will disappear. That’s the science behind a child’s theme, and why it’s good practice to always use one as it will prevent major frustration down the road. The Genesis framework functions as a parent theme, with a child theme included as a matter of course. This framework is the foundation upon which you build your website, and don’t worry, as you don’t need to know any code to customize your site using your child’s theme. If you want to learn more about child themes, you can read my post here. As stated previously, the Genesis framework functions simultaneously with a child’s theme, which is the skin that sits on top of the framework, safely storing your updates within its files so you won’t ever have to worry about future theme updates affecting the functionality of your site. Another great benefit of Genesis is its affordability as you’ll only pay a one-time fee, unlike other themes, which require an annual payment in order to receive the updates. A single payment of just $59.95 will guarantee you indefinite access to the framework. You’ll also receive a developer’s license. Having this license is significant, because not only will you receive all future updates, but you’ll also be able to take advantage of StudioPress’s customer service support team. Here’s the best part about Genesis. Once you pay for the framework and child theme, you can keep using them indefinitely, and on as many websites as you want. As you can see, Genesis is quite affordable. A child’s theme will run you anywhere form $20.00 to $80.00, and you’ll receive a developer’s license with this purchase, as well as, full access to detailed tutorials. Many of the individual StudioPress themes cost $129.95, but that includes the framework priced at $59.95. 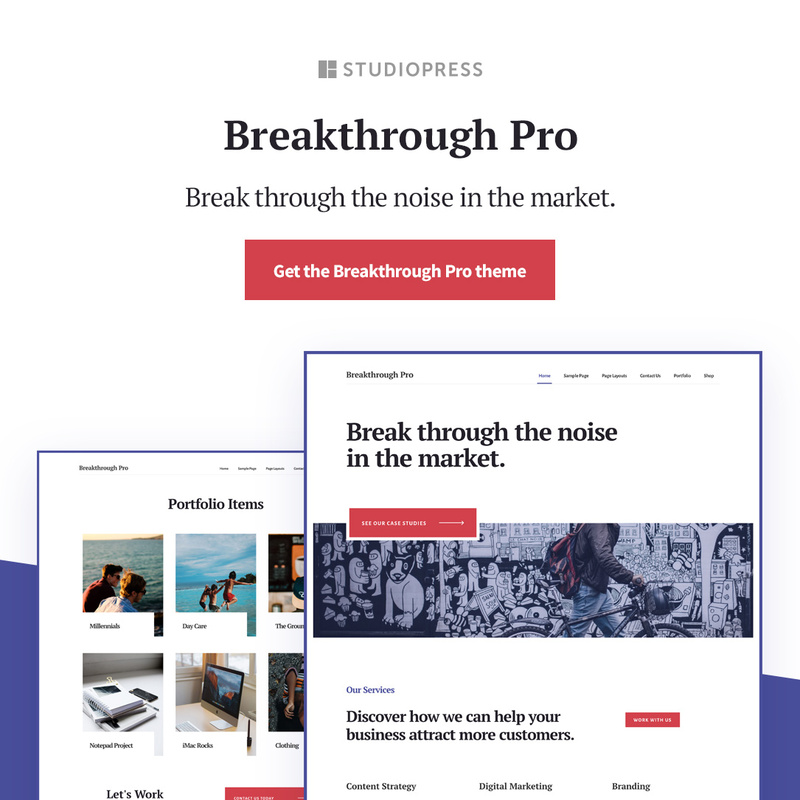 If you’re a website developer, designer or have multiple sites, you may want to consider purchasing the StudioPress Pro Plus All-Theme Package, which will run you $499.95. You will then have access to the entire library of StudioPress themes, and even additional themes from third party developers. This is a great deal because you’ll receive more than $1,700.00 worth of the best premium WordPress themes available, and in case you didn’t know, StudioPress basically invented the WordPress premium theme market. If that price sounds steep, just remember that you’ll have access to over 60 child themes that are currently available, as well as, themes that are yet to be developed. When you consider what you’d pay a professional website developer to build your site, it puts this cost into perspective. Like I said, many StudioPress theme prices include the cost of the framework, but if you have already purchased the framework, you’ll just need to buy the theme as Genesis is a one-time purchase. That means you can buy an additional child’s theme for only the cost of the theme itself. I’ll be doing a StudioPress theme review in the next month or two so please stay tuned. Now that you’ve bought Genesis and a theme, the fun part of customization begins. Like anything, there is a learning curve, and it will take you a while to learn how to use the framework. The good news, though, is Genesis is consistent in how it works, so every time you buy a new theme, the configuration will be the same even though the features may be different. There are many tutorials available online, and at StudioPress.com, that will teach you how to build your site using Genesis, and if customizing isn’t your thing, you can opt to use one of the 60 child themes, as is, that StudioPress offers. Click on the link below to get the Genesis Guide For Absolute Beginners. If you’re wondering if you can still use the vast library of plugins that WordPress offers, the answer is “Yes.” I was relieved to learn that Genesis supports WordPress plugins, and even has its own cache of plugins specific to Genesis. This is great news because now you can use both WordPress and Genesis plugins, however, realize that because of the nature of the framework, and the many features inherent in it, you won’t need to use as many plugins as you’ve previously employed. And if you’re concerned if Genesis will affect your website SEO, don’t fret because the framework has SEO settings already built into it. Genesis offers many features and customization options, and is mobile responsive, which is a big deal, since so many of us are continually on our smartphones. 1. Sign up for your free account at StudioPress.com. 3. Click on the blue “see Details and Pricing” button at the bottom of the theme. You’ll now see a button that says “Buy Theme + Framework.” Click the green button to buy both. 4. Now log into StudioPress and you’ll see the theme or themes you’ve purchased. 5. Press the blue “Download” button. Download the theme to your desktop . 6. Log in to you WordPress website. Wealthy Affiliate hosts my site so I go to their dashboard, locate my website, and log in. It’s super simple! 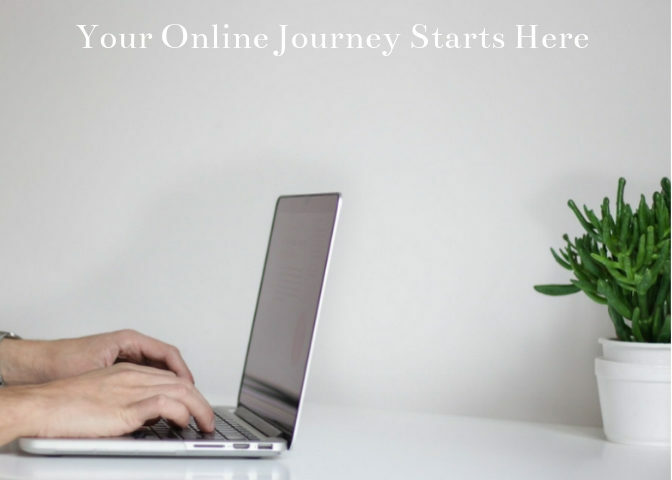 Wealthy Affiliate is an incredible platform, allowing you to build, design, and host multiple sites all in one easy location, and the support is unrivaled. You can sign up for free with no credit card required. It’s the real deal and not a scam! 7. Once inside your website, go to “Dashboard,” “Appearance,” “Themes,” and “Add New.” Now click “Upload Theme,” and using the browse button, locate the Genesis framework zip folder on your desktop. Genesis is technically a theme, that’s why you can upload it into your theme’s library. Don’t unzip the file, WordPress will do that automatically for you. Open and install the theme but DON’T activate it. 8. Press “Return to Theme’s page,” and click “Add New.” Hit the browse button, locate your new StudioPress child’s theme zip file, and upload it to your theme’s library. Open and install the theme. Unlike the Genesis framework theme that you didn’t activate, you now want to activate your child’s theme. 9. Visit your theme library again. You’ll see that your new theme has been uploaded. Click on “Customize.” Let the fun begin as you start designing your site. See how easy that was to install the Genesis framework and StudioPress theme? They work seamlessly together, allowing you to create an awesome website you’ll love, serving you well for years to come. Remember, if you decide to purchase an additional child theme, you won’t need to buy Genesis again, and you can use it, and your theme, on every site you own. I hope I’ve convinced you how great StudioPress and Genesis are. If you’re an affiliate marketer, internet entrepreneur, blogger, website developer, or graphic designer, you’ll definitely want to check out these terrific tools. Have you used the Genesis framework? If so, would you mind offering some tips and tricks that would be helpful to my readers? I would sure appreciate it if you’d take the time to leave a comment or suggestion below. Hey Holly! Thanks for taking the time to create this comprehensive guide and review on the Genesis framework. I have been wondering how it works so I really appreciate the part where you broke down how to use it with images and videos. I will bookmark this page and refer to it as I continue to grow my business. I love wordpress but I’ve never heard of this framework before. StudioPress sounds familiar and after reading this I might have to check them out and see if I can find other themes out there and change it soon. Thanks for sharing this, great review, I will have to make sure to book mark this for future references. StudioPress makes the themes, and Genesis provides the framework. You should definitely check them out! I love Genesis themes. I have Essence right now and it’s beautiful. And the best is that I don’t have to worry about licences and stuff. You pay once and it’s yours. You can use it to as many sites as you want and for whatever reason. Before Essence, I was thinking about getting another theme which was cheaper, but it had support for only 6 months and then you had to pay half the price more for each year you wanted to have support. Seriously? Genesis themes really are beautiful, and the fact that you can use them more than once is awesome. Thanks for reading! Hey, just wanted to say thanks for pointing me in this direction. I was looking for a premium theme for my new niche site, so I tried Genesis out. I bought the Framework and the Centric Pro theme. The thing I like about it is that it’s so customisable and the fact they work with child themes. That way the framework and the theme are completely separated in code. Also the code itself is light-weight, which improves responsiveness and therefore SEO. Awesome. I’m so glad you’re using Genesis. I love that you can customize your site using a child theme without messing up your code. Thanks for reading! I actually heard of Gensis last night! How convenient. Do they happen to have a free trial period so that you can see if you actually enjoy the site? This does seem as simple as Wealthy Affiliate site. I would like to try it out but come more familiar with it before I accept to pay the full amount. To me it’s kinda expensive but seems like it does the job perfectly. Thank you for sharing you knowledge about it & making it easier to understand how to upload themes. Unfortunately, Genesis doesn’t have a free trial period. You do only have to buy the Genesis framework once, and then you can use it indefinitely. Thanks for commenting! Hi I recently created my own website since I came into the affiliate marketing world, I think my site style is too simple so I was searching for ways to customize it. WordPress has some really good themes available for free but it will be nice If I can do it exactly as I want, but I also worry about getting the Genesis framework and will not be able to use it since I have no experience at all with the design. Will still be a good deal for me? Yes, the framework, like anything, has a learning curve, but you’ll quickly get the hang of it. Free WordPress themes are fine to use as well. Thanks for reading! I have been using WordPress for years, and I am here to tell you that the hardest part about WP these days is setting your site apart. There are so many folks out there using WP, and most are just using free themes. There’s like a sea of websites that look just alike as a result. Investing in a good theme is probably the most important thing you can do to take your website to the next level. I’m glad to hear about StudioPress and Genesis. Anything that can make this process easier means more time creating content and not tinkering with WP. I’ll give it a look. I agree with you, investing in a great theme is an important factor in website design!